Preparing your next PowerPoint presentation doesn’t have to be too taxing. Yes, it’s true that the medium has its problems. But you can solve most of these problems. So, now’s the time, to be more choosy with the PowerPoint palette. And, take on board some simple PowerPoint presentation skills. Therefore, when you are ready to prepare your next PowerPoint presentation here are ten essential tips for better PowerPoint presentation skills. Typeface. Choose a typeface that your audience can read on your presentation screen. Experiment with a serif Typeface such as Times New Roman and sans-serif typefaces such as Arial and Verdana (Format: Replace Font). Font. You want your words to be readable by your audience—so, aim to use a font with a point size that is fully legible: 16 point or 18 point, perhaps (Format: Font). Of course, the fonts on this RB results presentation could always be improved. But, visually it’s a good piece of work. Colours. Your choice of typeface colour is also important (Format: Font: Color). That’s because some colours will be less visible to your audience than others. Greens and reds can be indistinct on a white background. Blues and blacks have more visibility. Therefore, don’t forget to consider your background colour scheme (Format: Background). The colour scheme on this Whitbread results presentation is a good example. Bullet Points. It’s often the bullet point list that creates most problems for your audience. Since there are either too many bullet points, too many words per bullet or just too many lists in a presentation. They work best when you want to summarise or signpost direction. So, this is what we’ve done. And, this is where we are going. Clearly the Solitary 101 PowerPoint presentation has one clear message. But it’s totally let down by the bullet points. Images. Aim to use images as effective visual metaphors in your presentation (Insert: Picture). This is because they will enhance and support your speech. But, do make sure that your pictures are big enough to fill the screen. Video. Use video and audio files in your PowerPoint presentation when you have the opportunity (Insert: Movies and Sounds). Of course, it’s an ideal way to build interest and keep your audience engaged. Charts and graphs are key to many presentations (Insert: Chart). Remember to keep the charts big, without too much distracting detail. Don’t mix them with bullet points. Since doing it like that weakens their impact. So, try to use the “build” technique (Slide Show: Custom Animation). Your chart can build itself as you speak—based on rehearsed timings or your mouse click. It’s very effective. Special effects can make or ruin a presentation. Thus, try to be selective in your choice of PowerPoint effects (Slide Show: Animation Schemes and Slide Show: Slide Transition). Don’t allow the special effects to be more memorable than your message. Talking. Avoid the temptation to look at your PowerPoint projection when talking. Because, each time you do so you lose eye contact with your audience. So, use the Fn F5 shortcut on your keyboard to toggle your notebook display and your projection display. Then, you can always glance at your notebook screen without losing audience contact. Remember the point, turn and talk technique for PowerPoint. Point at the screen, turn to your audience and then make your point. That’s how you point, turn and talk in your PowerPoint presentation. PowerPoint gives you some exciting tools for your presentation to be truly successful. PowerPoint’s visual and multimedia effects can be stunning. Just beware the trap presented by too many special effects and the standard text layouts. 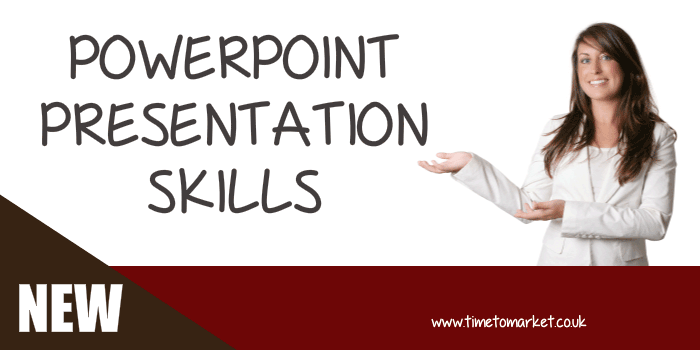 These PowerPoint presentation skills tips should help with your next presentation. For more PowerPoint presentation skills tips you can always join a PresentPerfectTM training course. And because you have the choice of either a scheduled course or your very own training course for your team, there’s plenty to consider. So, please don’t hesitate to get in touch when the time is right.